Broadcat is like 80% millennials. And that means we can get treated like aliens at compliance conferences and in compliance marketing, where people happily throw around millennial stereotypes—especially when they're trying to use us as a boogeyman to sell stuff. Oh, I’m so sorry. I fell asleep on the keyboard there! Anyway: this "millennials don't read, so they need video" stuff is nonsense. And it is nonsense for two reasons: (1) it conflates entertainment and behavior and (2) millennials read as much (or more) than other generations anyway. Reason #1: It conflates entertainment and behavior. The first reason "millennials need video" is nonsense is because it conflates the entertainment habits of millennials with the kind of guidance they need to do their jobs ethically and compliantly. And, you know, those are different things. It is saying “hey, millennials like watching videos on Netflix, therefore this other thing should be like Netflix!" Because people do not need to do anything differently after consuming entertainment; you just need them to passively watch it. The goal of Netflix is to get people to watch Netflix. That's it. Compliance training, on the other hand, is a waste of time unless people do something differently afterwards. The goal isn't to get people to watch it; it's to get them to do something differently, and the training is just a means to that end. Just to be really heavy-handed about this: "watch Netflix" and "do your job compliantly" are wildly different goals. That's why the entertainment analogy is so damaging; it sets the bar way too low. And, of course, when we're specifically talking about millennials, there's always the fact that millennials read as much or more than older people anyway, so even the "millennials don't read" premise, which often undergirds this whole thing, is garbage. What? Yes. It's our next reason. Reason #2: Millennials read as much or more than other generations. Saying "millennials will only watch short videos because they don't read anything” feels like it must be true. Because, uh, Snapchat? I don't know why, but I honestly get it. My guess is that it's just been repeated so many times in hacky thinkpieces that we've all assumed it must be based on something. Here's the thing, though: the data shows the opposite. Let's check out some charts from the Pew Research Center, y'all! To level-set, we'll be looking at a 18-29 age bracket here, which is basically younger millennials and the earliest part of Gen Z per Pew. So we're fudging "millennials" a little, but in a way that skews slightly towards the even-more-mysterious Gen Z. We'll start with this chart from 2016 showing that younger adults are more likely to read the news than older ones—it's the older generations who prefer watching it. You can get that full report from Pew here. And then, finally, there's this chart from 2018 where the data is cut a little differently, also showing younger folks are more likely to read a book—it's the people 50+ who were more likely to say they didn't read a single book in any format in the past year. What's the takeaway? 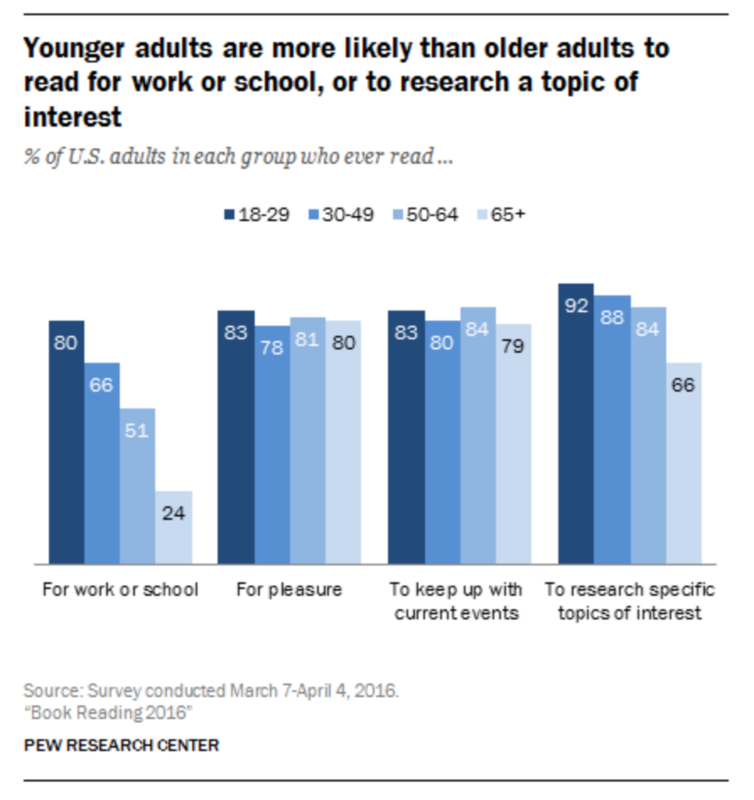 No matter how often you hear "kids don't read these days," young adults are as much or more likely to read than older adults in a variety of contexts. Now, should you use compliance training videos? As always, our advice is that you should pick your format based on the problem you are trying to solve. That is how grown-ups do things: they pick the right tool for the job. They don't just pick a random tool because it looks cool and then try to use it for everything. For what it's worth, I think video is a terrible format for the vast majority of compliance training problems, but there are certainly circumstances (especially in health and safety) where it should excel. That's a separate post, though. 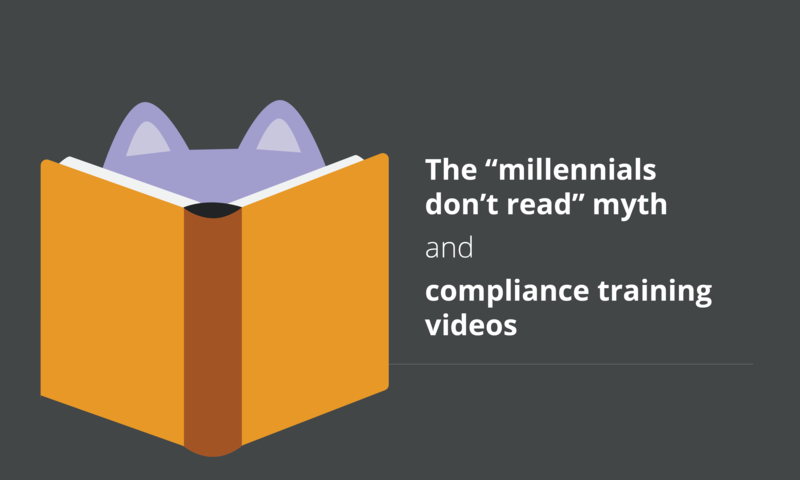 For now, know that "because millennials don't read" is not a good reason to use videos. That's false and condescending. And know that "because millennials watch Netflix" is not a good reason, either. The entertainment analogy is toxic, because the goal of entertainment is to just get people to watch the entertainment—that's what we refer to as "check-the-box" in compliance. The goal of compliance training is to get people to behave differently, not just watch training. How do you do that? Well, you have to stop thinking about format and start thinking about things like framing, timing of delivery, and measurement (and then you can get back to format). And good news: we have a book that lays out how to do it, whether you work with us or not. It is free. Go here for a copy.